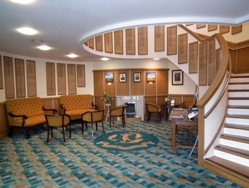 The clubhouse at Hayling Golf Club provides a magnificent setting for both social and business functions and family celebrations. We have several rooms which can be hired separately or together to provide you with the fundamentals of an event to remember.The restaurant on the first floor offers superb views over Sinah Lake and is connected to the Sandeman Bar with doors that can be configured to provide a through-facility to host weddings or parties. 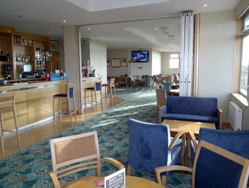 The Sandeman Bar looks over the Solent to the Isle of Wight and both have easy access to a large wrap-around balcony. We have a movable dance-floor that can be sited at your place of choosing if you want to dance the night away. Alonsgide the Sandeman Bar is the smaller Solent Bar which is generally used by Members on weekends when social functions are in progress but on certain dates may be available in conjunction with the Sandeman Bar/Restaurant. For those without your own PA system we can provide access to a full BOSE-speaker system with wireless microphones anywhere upstairs. Downstairs the Sinah Room offers a smart yet intimate room with its own bar and dumb-waiter facilities that could be used for pre-dinner receptions. For business events the room can offer boardroom or theatre-style seating with projector/screen and audio/visual facilities for up to 20 people with associated catering. The Sinah Room overlooks Sinah Lake, with its abundance of wildlife, which is often used as a backdrop for some fantastic wedding photographs. 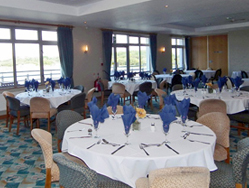 member sponsor) please contact our general office on 023 9246 4446, and we take pleasure in making sure that your ‘special event' is one you will remember!